yEd Graph Editor for Windows is a software which has been developed by yWorks. This program is used to help the user creating graphs and diagrams on his computer. Creation: This software offers various tools enabling the user to create diagram. If he has some difficulties, there is no need to panic for the program has ready -to- use elements to choose from and which can be perfectly used. 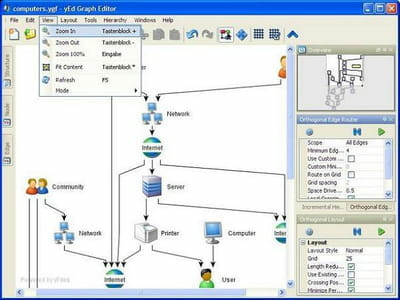 Layout: yEd Graph Editor for Windows offers the user the possibility to set the layout manually or let it be done automatically by the software. It uses a mathematical algorithm which arranges the elements. Formats: There are several formats in which the user can import and export his creation. Among many others, the import formats are GraphML, GEDCOM, GML. And for the export, it supports SVG, BMP, PDF and SWF. yEd Graph Editor for Windows is completely downloadable for free. It is available in English and German. It has an intuitive interface which makes the diagram edition easy to handle. Latest update on August 19, 2015 at 03:57 AM.